Sony's S-series Walkman is their new high-end digital audio player that is not only their slimmest player to date, but has active noise cancellation and the SensMe music suggestion engine. Sony bundled 13.5mm EX headphones with the S-series players, as well as a pass through cable that connects to an in-flight entertainment system and uses the noise canceling capability of the Walkman. 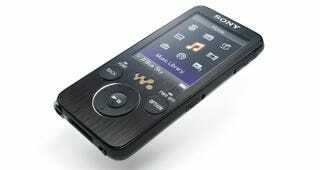 In addition Sony released their midrange E-series and entry-level B-series Walkman players. The S-series has a 2-inch QVGA screen, that not only plays back WMA, AAC and MP3 audio formats, but also WMV and MP4 video. SensMe is featured on a Walkman player for the first time, previously only on Sony Ericsson Walkman-branded phones. For those unfamiliar, the SensMe engine analyzes a song for various qualities and maps it on an X-Y chart. From there you can select what type of music you want to listen to according to "mood". The S-series is only 7.5mm thick, has 40 hours of audio playback and 10 hours of video playback on a single charge. The E-series is Sony's mid-range Walkman offering, which features the same audio and video playback the S-series offers, but lacks the noise cancellation and SensMe features. Unlike the S-series, the E comes in multiple colors, including black, red, blue and pink. It has 45 hours of audio playback and 8 hours of video playback. The E-series is also available in 4 GB and 8 GB sizes. The B-series is Sony's no-nonsense line of Walkman players that only play music. But in addition to audio playback, the B-series also serves as a voice recorder and FM radio. It has 16 hours of battery life and also comes in multiple colors like the E-series. The B-series plugs directly into your USB port for drag and drop file transfer and comes in 1 GB and 2 GB sizes. SAN DIEGO, Aug. 28, 2008 – From noise-cancellation for frequent travelers to affordability for customers on a budget, Sony today unveiled three new Walkman® players (series S, E and B) that have something to offer nearly every customer segment. "Whether the fit and finish, the engineering or the integration of unique technologies, each of these new series has different points of appeal," said Mitch Li, product manager for Walkman players in the Digital Imaging and Audio Division at Sony Electronics. "These new Walkman players satisfy the need of consumers who don't want to sacrifice sound quality for the digital music and MP3 experience." The top-end, format-friendly Walkman S-series broadens options for enjoying tunes from multiple sources, including many download stores and personal music collections. The supplied Content Transfer software even simplifies "drag and drop" transfer of non-DRM music, videos, podcasts and playlists from online music services to Walkman players. If you're migrating your personal collection of ripped tracks from another MP3 player, there's no need to re-rip all your tunes from your CDs. Support for popular audio and video codecs is enhanced because the S-series Walkman devices play Windows Media Video (WMV) files with DRM, allowing you to enjoy rights-protected movies and video clips from other media collections. Additionally, the S-series Walkman players are the first MP3 players with Sony's SensMe™ Channels function, which automatically creates channels that can align with a user's preferences. Based on Sony's SensMe Channels function, the S-series players analyze a user's music collection and suggest channels based on each song's speed, mood and rhythm. They create a choice of 11 themed channels from upbeat pop to emotional ballads. Whether commuting, flying high or just listening to music at home, the new S-series Walkman players help diminish background noise while improving your overall listening experience. The top-end S-series Walkman players feature integrated active noise cancellation with supplied 13.5mm EX noise canceling headphones and an accessory cable that extends the noise canceling functionality of the device. On airplanes, travellers can – for the first time – connect the S-series player directly to a plane's audio video system with the included accessory cable and enjoy regular in-flight entertainment with the bonus of high-quality noise cancellation. Just 7.5mm thin, the super-light S-series is the slimmest Walkman player in any of the new series. It has a bright, high-contrast 2-inch QVGA LCD screen (measured diagonally) that has an ultra-quick response time, with smooth playback at up to 30 frames per second and selectable horizontal/vertical viewing. The interface can be personalized with the user's choice of 10 pre-installed wallpaper images or their favorite digital photo. The E-series combines high-quality video and audio performance to create the perfect device for enjoying favorite photos and video clips. Like the S-series, all E-series models are format friendly, easily playing back ripped tracks from your personal music collection, music store downloads and rights-managed video clips. Non-DRM files can be transferred by "drag and drop" from online music services to Walkman players. Support for popular audio and video codecs is enhanced because the E-series Walkman players can also support Windows Media Video (WMV) with DRM, allowing rights-protected movies and video clips from other media collections. The affordable entry-level Walkman B-series player offers the high-quality sound that users have come to expect from Sony. The ultra-portable devices can connect to your PC's USB port for easy "drag and drop" file transfers. Like all other Walkman models, open support for Windows Media Audio (WMA) and MP3 codecs enables users to buy, copy and manage music to fit their needs. The stylish design is enhanced by an illuminator that pulses in time with the music when the bass button is pressed. The device has an FM radio for enjoying favorite stations and a voice recorder that's great for capturing memos, shopping lists or random thoughts while you're on the move. The battery life is up to 40 hours of music playback for S-series, up to 45 hours for the E-series and up to 16 hours for the B-series. The battery life is up to 10 hours of video playback for S-series, up to 8 hours for the E-series. The battery life is also up to 30 hours of audio playback for the S-series when the noise-cancellation feature is activated. Actual battery life may vary upon usage patterns, product settings, battery and environmental conditions. The E- and S-series Walkman players support an open platform, providing more choices for downloading and managing music and video collections online. The devices can support security-enhanced Windows Media Audio (WMA), as well as non-secure AAC, linear PCM and MP3 music formats plus JPEG files for photos, in addition to the WMV with DRM, AVC (H.264/AVC) Baseline Profile and MPEG-4 video codecs. * The NWZ-S736F has approximately 4GB of internal storage and will cost about $150. * The NWZ-S738F has approximately 8GB of internal storage and will cost about $180. * The NWZ-E436F comes in black, red, pink, blue, has approximately 4GB of internal storage and costs about $100. * The NWZ-E438F comes in black, red, pink, has approximately 8GB of internal storage, and costs about $140. * The NWZ-B133F player has approximately 1GB of internal storage; comes in black, red and blue and will cost about $45. * The NWZ-B135F player has approximately 2GB of internal storage; comes in black, red and pink and will cost about $60. Presales have begun for the new Walkman models online at www.sonystyle.com/walkman and at Sony Style stores. The players will be available in September across the country at military base exchanges and at authorized dealers nationwide.